A scenario for re-orientating the UK economy with citizen’s income, minimum wage, maximum take-home-pay, sufficient financial support for the economically inactive, an end to child poverty, and a fair contribution to overseas aid, at a time when economic growth is surely coming to an end, and global climate change demands drastic cutbacks of a rich, developed nation like ours. In March 2009 the Labour Party website invited contributions to a noticeboard of what one would want to say to Prime Minister Brown, President Obama and the other G20 leaders before their April meeting. Recognise that the end of economic growth in the developed countries of the world may save the planet from global warming; celebrate it by introducing a minimum and a maximum fair wage and replace the complexities of most benefit and tax credit systems by a universal citizen’s income, (repaid in full by each individual wage earner and financed by income tax on all wage earnings) which gives fair support to the out-of-work and those who can’t work – like children, students, voluntary workers, the elderly, the infirm, and those who support family members at home. Don’t try to rebuild the old economic system – create a new one of stability, sustainability, and succour for the poor of the world based on a convivial ethos instead of wealth creation. We are now the richest generation which has ever lived on this planet – let us act wisely to safeguard the quality of life of our grandchildren and of theirs. This paper sets out what this could mean in the UK for its 61 million residents. A scenario budget for citizen’s income in the UK with minimum and maximum limits to wages is constructed which shows that these ideas are at least viable. Like Lloyd George’s revolutionary budget of 1909 it would be variously popular and unpopular for it would mean that the poor were winners and the rich were losers. Some of the possible consequences are discussed: it would end child poverty, support those who lose their jobs, encourage voluntary work, and forgo economic growth. It would change our ‘inequality’ ratio from about 1 : 7 to about 1 : 3.6 and after a few years this should have a major impact on our society (endnote a) – improving our health, reducing mental illness, improving education, reducing crime, and, by increasing the trust between people help build the vibrant communities that will be needed to cope with future environmental problems. But beyond these, this scenario, by reducing the amount of money available for consumer spending, would make our carbon footprint smaller and move Britain towards the target (adopted by Nicholas Stern in A Blueprint for a Safer Planet 2009 (endnote b)) of reducing our carbon emissions by 2050 by at least 80% of our 1990 level. Too much and too long, we seem to have surrendered community excellence and community values in the mere accumulation of material things. Our gross national product ... counts air pollution and cigarette advertising, and ambulances to clear our highways of carnage. It counts special locks for our doors and the jails for those who break them. It counts the destruction of our redwoods and the loss of our natural wonder in chaotic sprawl. It counts napalm and the cost of a nuclear warhead, and armored cars for police who fight riots in our streets. It counts Whitman's rifle and Speck's knife, and the television programs which glorify violence in order to sell toys to our children. Yet the gross national product does not allow for the health of our children, the quality of their education, or the joy of their play. It does not include the beauty of our poetry or the strength of our marriages; the intelligence of our public debate or the integrity of our public officials. It measures neither our wit nor our courage; neither our wisdom nor our learning; neither our compassion nor our devotion to our country; it measures everything, in short, except that which makes life worthwhile. Anyone who sees the film The Age of Stupid (endnote e) will recognise that we in the developed world have a lot of rethinking to do. It was sad, but no surprise, that the world leaders on 2 April 2009 opted for continuing growth and paid little attention to survival of life on the planet. Perhaps we have to wait for the next global crisis – which as likely as not will be ecological, not economic – and hope that there is still time to tackle the issues of massive climate change. Likewise, Alasdair Darling’s budget of 22 April 2009, while making slight moves towards reducing poverty, taxing the rich more heavily and a greener economy, envisaged that within a couple of years we would return to economic growth. This paper suggests one way that this might be done while preparing us to tackle the root causes of global climate change. Citizen’s Income is an idea that has been around for a long time. The Citizen’s Income Trust (endnote g) describes it as an unconditional, automatic and non-withdrawable payment to each individual as a right of citizenship. It would phase out as many reliefs and allowances against personal income tax and as many existing state financed cash benefits as possible, and replace them with a Citizen’s Income paid automatically to every man, woman and child. … It varies only with age; and there will be additions for disability. It would mean that every citizen would have a small independent income, whether or not they are in paid employment and it would be paid to individuals, not couples, families or households … and would be symmetrical between men and women. The Citizen’s Income Trust put forward calculations which show it costing slightly less than the overall costs of social security and tax reliefs. The following calculations are not those of the Trust. My scenario figures are more generous in their payments, and realign taxation levels with a firm minimum wage and maximum wage. They would lead to a substantial redistribution of incomes across the country – with the poor becoming richer and the rich becoming poorer. As such it is a powerful socialist proposal which, unlike New Labour, recognises that today there is a problem with the filthy rich. Suppose that citizen’s income is paid out of the national coffers to everyone. Suppose that it is at the annual rate of £3,300 for the 19% of the population who are children up to 16, £7,500 for the 19% who are ‘aged’ (men over 65 and women over 60), and £5,500 for everybody else. This is seen as a citizen’s right and entitlement – it is not based on a means test and is not taxed. But the 46% of the population in employment don’t benefit from it because it is immediately reclaimed by the tax authority: they are not aware of it and it doesn’t need to feature in the following table. But they are aware that if they lose their job – for what ever reason – they will immediately begin to receive the citizen’s income at the rate of £106 per week which is £5,500 per year. Child benefit at present is £1,040 per year for the eldest child under 16 and £686 for other children. Putting citizen’s income at £3,300 for every child should lift every child out of poverty and ensure that parents are not penalised compared to those without children. At 16 children would either join the ‘inactive’ (as sixth form students) and get the £5,500 a year citizen’s income, join the ‘out-of-work’ at the same rate, or take a job at the minimum wage level with take-home pay of £11,000 a year. Our 11.5 million children would cost the country on this scenario £38 billion per year. The basic state pension at present is £4,540 per year, which is widely recognised as below any reasonable assessment of the poverty line. Putting it at £7,500 is roughly in line with the Joseph Rowntree Foundation research-based proposal (endnote h) per year for every one over 60/65. This sets it at 60% of the net income of the lowest level of employed pay. It would cost £85 billion per year for the 11.3 million women over 60 and men over 65. At present there is a job-seeker’s allowance for those over 25 of £60.50 per week for just 26 weeks. Even if this were paid for as long as needed it would only amount to £3,146 per year. For someone who is a long term invalid or seriously disabled there is a basic £84.50 per week, which totals £4,394 per year. The Rowntree study (mentioned above) makes it clear that these sums are inadequate and proposes a sum of £210 per week (£11,000 per year) as a minimum income standard including rent/mortgage for a single person of working age. In the scenario of this paper, as suggested above, citizen’s income would be paid at £5,500 per year to everyone between 16 and 60/65: for those in paid work it would be taken back by the tax authority – and so is not listed in this paper. For 7.8 million described as ‘economically inactive’ and 2.0 million out-of-work work (ie ‘job-seekers’) it would cost the country £54 billion. This would include students, job-seekers, long-term invalids, the seriously disabled, parents at home, voluntary carers of the elderly, house-folk who choose not to be wage earners, and – admittedly – the ‘layabouts’ who worry the right-wing politicians and tabloid media. This is discussed further below. In assessing present levels of state support it is not easy to assess the payments of tax credits. A Government website indicates that a 30 year-old single man, living alone, earning £10,000 a year gets about £12 a week in tax credits, which amounts to £624 a year, while a couple with 3 children earning between them £25,000 get about £55 a week or £2,860 a year. These figures all suggest that the proposed levels of citizen’s income would considerably improve the lot of the 55% of the UK population who are not earning an income. They would total £177 billion per year. What is difficult to understand – and may represent a major flaw in my argument – is that in 2008 the national expenditure on pensions, tax credits and benefits, lumped together as ‘social protection’, amounted to £169 billion and in 2009 ££189 billion (endnote i). As shown above, the proposals in this paper are considerably better than the present levels of payout – but the total payouts are roughly similar. Does a significant proportion go on administering the complex system? Or have I missed something? Many commentators have pointed out that the curious way in which ‘income tax’ is talked about as though the basic level were 20% (after personal allowances) is misleading since national insurance, at another 11% for many people, is also a tax on income. In the scenario of this paper national insurance is subsumed in income tax. With employees national insurance subsumed into income tax the contribution which individuals make to the financing of government expenditure would become more transparent and much simpler to administer. Table 1 gives the income tax, national insurance payments and take-home pay of UK residents at different levels of income. 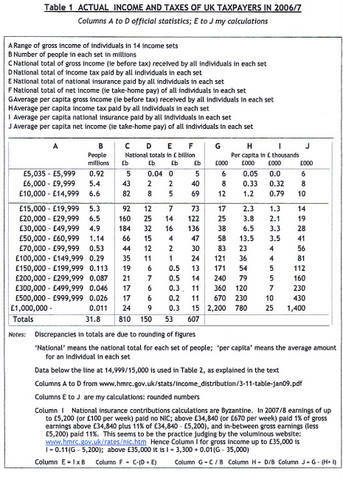 The data on income and income tax comes from a National Statistics Office table for 2006/7 (endnote j). In the UK 31.8 million people earned a total of £810 billion and paid £150 billion in income tax and £53 billion in national insurance, leaving £607 billion in ‘take-home pay’. It is not clear how much of the income figures in any set is part-time earnings, or ‘unearned’ income in the form of dividends etc. Presumably many of the people in the range of gross income of £5,035-£5,999 and £6,000 – £9,999 will be part-time workers. These are excluded from the scenario in Table 2 as being outside the proposed minimum wage. If my calculations are correct this table shows the curious way in which national insurance contributions impinge most heavily on those in the £20,000 – £49,999 brackets. In this scenario a minimum wage level is set at £11,500 wage with a take-home-pay-after-tax of £11,000. This figure is in accord with the Rowntree research discussed above. The present government figure is £10,429 which arises from a 35 hour week at £5.73 per hour. In Table 2 the lowest set of income levels, £11,000 - £14,999, has been calculated on the assumption of 9 million people earning on average £13,000 and paying £500 in income tax. Anyone moving from being economically inactive, or out of work, to working part-time would have a reduction in the citizen’s income, coming down to zero at the stage of reaching the minimum earned income: each reduction being such as to ensure that the employment was worthwhile and maintained an increase in income. (I.e. avoiding the benefit trap that we see today). On the grounds that taxation should be seen as just contributions to the common good, the scenario requires every wage earner to pay income tax, but on a steadily increasing scale. Those earning the minimum of £11,500 pay only £500 per year (bringing their take-home pay to the Joseph Rowntree Foundation minimum standard). Many of the chief executives of industry and the financial so-called ‘masters of the universe’ receive levels of remuneration which many of us consider to be obscene. How can anyone deserve to be paid £1 million or more – as was the case for 11,000 people in the UK in 2006/7? They tell us, of course, that they deserve it because of the risk-taking that they are engaged in – and today we know that they weren’t even clever enough to realize that the credit bubble must eventually burst. They say that their pay is the going rate for their level of work and add that they will leave the country if they don’t get it. Well, the risk taken in this scenario is to let them go! The radical proposal here is that nobody should have a take-home pay (ie after tax) of more than 9 times the take-home pay of the lowest paid. If the lowest paid have, in Rowntree’s terms, what is needed in order to have the opportunities and choices necessary to participate in society, then any one with two or three times that should be in clover, and to have nine times it should be the height of affluence. So, anyone whose company pays them £1,000,000 a year, pays £900,000 in tax. And the 11,000 super-bosses who according to Table 1 are paid an average of £2,200,000 for their services, will pay an average £2,100,000 in tax. To most people, it is remarkable that anyone actually needs as much as even £100,000 to enjoy a good quality of life. What is certain is that fast cars, over-heated swimming pools, frequent flights to exotic holiday resorts, luxury hotels and many other of the trimmings of the very rich, put undue pressure on the environment – and need to be curtailed if we are to reduce our carbon footprint and begin to save the world. It can also be argued that through the media they debase our national culture by suggesting impossible aspirations for others. Before they squeal too loud, we should ask whether it is the gross income that gives them the craved esteem of their fellows, or the take-home income. The fact is that everyone’s view of prestigious salaries is quoted as gross and not net. So, if this is the testosterone of the higher echelons of the business world, let them be paid these gross sums, glory at the level, boast about it, but pay the tax! It is, of course, up to the tax authority to track them down and ensure that people who claim citizenship, who work here, use our infrastructure and enjoy our national culture, pay their taxes here. Bringing these ideas together, Table 2 sets out the proposed scenario for changing our economic system in order to narrow the gap between the rich and the poor. It is, of course, mind-blowing. In between a minimum and a maximum wage it will be necessary to steadily increase the percentage paid in tax – along the lines suggested in Table 2 but using a smooth increase rather than a stepwise one as here. This table shows how these proposals would affect every one of the 60,600,000 people in the UK. For the 32,600,000 not in employment it shows citizen’s income. For the 28,000,000 in employment there are 12 levels of taxation (based on Table 1). 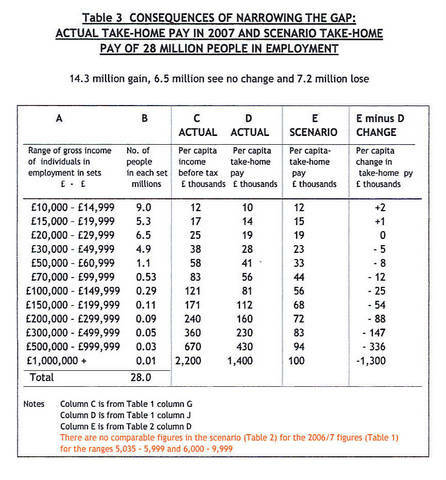 As Table 3 shows, for those earning less than £20,000 a year there would be gain, for those earning £20,000 - £30,000 there would be no change, but for those earning more than £30,000 there would be a loss in take-home pay – but they would still be several times better off than those at the lowest level. Overall, on these figures, citizens’ income would cost £177 billion and income tax would raise £272 billion. Comparing this with actual figures the nearest equivalent to citizen’s income is termed ‘social protection’ and scenario income tax needs to be compared to present-style income tax plus national insurance. In 2008 social protection cost £169 billion and income tax plus national insurance raised £265 billion (endnote k). The just released 2009 figures are social protection £189 billion and income tax plus national insurance £239 billion (endnote l). All these figures show is that the scenario is in the realm of the possible. It would be absurd to be more precise than that because other sectors of the economy, both revenue and expenditure, change from year to year and, to varying extents, could be affected by the proposals. WHAT HAPPENS IF THE COST OF CITIZEN’S INCOME IS SUCH THAT THE BUDGET CAN’T BE BALANCED? The scenario figures in Table 2 are, of course, no more than plausible guesswork. The only fixed points are the level of minimum wage and the level beyond which the net income cannot exceed £100,000. 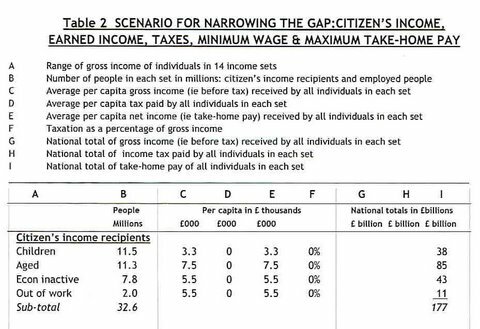 One of the annual tasks of the Chancellor of the Exchequer would be to determine the quantum of citizen’s income (ie the actual figure for what in the scenario Table 2 is £5,500 for the economically inactive and the out-of-work, £3,300 for children and £7,500 for the aged) and, to keep pace with any inflation, the actual levels for the minimum and maximum levels. In other words, as now, the Chancellor would need to balance the budget. Suppose that the numbers of the economically inactive rise appreciably. The Chancellor would need to reduce the quantum to balance the budget and the likely result would be that more economically inactive people would seek jobs and become employed. So the system would adjust to maintain equilibrium. But it would need people to trust the political system to be acting in everyone’s interests and not, at the next election, vote to reject the ruling party on the promise from the opposition that they would act to give either greater support to the rich or to the poor. Perhaps, as suggested in the next section, levels of trust in society would rise as a result of less inequality between rich and poor, and this might improve the working of democracy. The recent book The Spirit Level by Richard Wilkinson and Kate Pickett (endnote m) shows how many factors in national life are influenced by the gap between the best off and the worst off. They quote UN statistics showing that the ratio between the average take-home pay of the 20% worst off and the 20% best off is just under 4 in the Nordic countries Finland, Norway and Sweden, 7 in the UK and nearly 9 in the USA (endnote n). In a remarkable series of graphs they show the relationship in many of the developed, industrialised nations between inequality of income and an impressive list of social parameters. For each of these social parameters the three Nordic countries show a much better quality of life than both the UK and the USA. In such a situation how much income one appears to earn and how much wealth is displayed by one’s house, car, material possessions and overseas holidays, compared to others living in the same street, or at work, becomes an important marker of social status. The wider the incomes inequality in society the more ‘rungs’ there are on the ladder of social status and the more disparate society becomes. This is the kind of change in UK society which could be expected if the scenario were adopted. At present some 3,600,000 children are described by government as living in poverty because the household income is less than 60 per cent of the national median. Government aims to reduce this by half by 2010 (which it claims would require an extra £10 per week per child) and eradicate it by 2020. In order to do this it wants parents to be in employment and accessible and affordable childcare to be available for all. The Royal College of Paediatrics and Child Health recently stated: Poverty has severely limiting effects on children’s lives, well-being and health. Children in the poorest families are more likely to be born small and are at least twice as likely to die unexpectedly before their first birthdays. They are two-and-a-half times as likely to suffer chronic illness as toddlers and are three times as likely to suffer mental health disorders throughout their lives. As children, they are more likely to be admitted to hospital, which in turn places a heavy burden on the NHS. Adults who experienced poverty as children face a shorter healthy lifespan and will die younger. The median income of adults in this scenario is in the £11,500 - £14,999 income level. If the median is £11,500, 60% is £6,900. The least well off household would be a single parent out-of-work or otherwise economically inactive with one child: the household income (as citizen’s income) would be £8,800. Thus the scenario would lift all families with children out of poverty and would provide adequate support for families where one of the parents chooses to stay at home to be with young children. Judging by the comments of the Royal College it would be a very significant change for many people. At first sight this looks like a recipe for disaster since the economically inactive are supported by the wage earners. But if Wilkinson and Pickett are right, reducing the gap between the rich and the poor and thereby increasing levels of trust in society, would appreciably reduce the national expenditure on health services and penal systems and so the overall national budget could be stable with fewer wage earners. Political discourse today is obsessive about wage earning contributing to economic growth. For example, there is pressure on young single mothers to go out to work and to hire someone to look after the child. When this happens there are two people contributing to the gross domestic product in place of none. But suppose the woman would prefer to look after her child herself: citizen’s income for her and for her child would enable this to happen. To the dismay of most economists, her decision would not aid economic growth. But is economic growth a proper aim for a rich country? Political discourse today is also obsessed with the idea of hard-working people. Labour first changed its concern for the needs of working people to the needs of hard-working people and the Conservatives have followed suit. Why should people work hard? Isn’t it for them to decide? The simple answer is that if they don’t work hard the nation will not have economic growth. But, again, is economic growth a proper aim for a rich country? In Ecclesiastes (endnote p), the philosopher asks What do we gain from all our work? In the mists of uncertainty he concludes, I realized that all we can do is to be happy and do the best we can while we are still alive. All of us should eat and drink and enjoy what we have worked for. It is God’s gift. Whether one is theist, agnostic or atheist, the message is the same. It is the quality of life that matters. Since work is part of life for nearly everyone, it follows that the quality of work matters. Looking again at contemporary political discourse, it tends to be forgotten that the notion of work is much wider than wage-earning work. Mothers looking after young children are working (unpaid) from the time the child awakes till the child goes to sleep, and even then the mother is on the alert. Family members caring for sick or infirm relatives are working (unpaid). The allotment owner is working (unpaid) to provide food for the family. The neighbour who takes food to the elderly person next door is working (unpaid). And, of course, anyone engaged in study is working (unpaid). Beyond this are the organised forms of voluntary work (unpaid) of charities, drive-patients-to-the-doctor schemes, hospital visitors, prison visitors, election workers, and so on. Work is part of the stuff of life. For some it is an intolerable grind, but for most people it is a way of relating to others and provides a sense of achievement, which however small is worthwhile. For most it is a source of contentment and satisfaction. (When this is not so either managers or politicians have a case to answer for). It is a deep set part of our culture. People want something worthwhile to do with their lives. The concern that citizen’s income would turn people into layabouts and idlers, is ill-founded. Very very few people want to stay in bed most of the day. They may not want to work long hours, but they want something satisfying to do and, supported by citizen’s income, that may well be voluntary work. Since citizen’s income in this scenario is less than what is seen in the Rowntree study as necessary for a ‘socially acceptable standard of living’ there will be an incentive for many people living alone to seek paid work, but for couples with young children it will be much more practical than now for one of the parents to be a wage-earner and the other a house-parent and probably swopping roles from time to time. The scenario suggests that an economy could be created in which it is not necessary for every able-bodied person to be a wage earner. Indeed it can be argued that some jobs in our society are unnecessary for the common good - such as those that promote turbo-consumerism (see endnote (r). Such an outrageous idea needs to be argued at more length than this paper offers. But we do need people providing our food and green sources of energy, and people who provide the public services on which we all rely. [IV]	WHAT ABOUT OVERSEAS AID? At a time of recasting the economic system it would be appropriate to build in a budget item of 0.7 per cent of GDP for overseas aid, which is the UN expectation and for which at present we only achieve 0.48 per cent. Denmark, the Netherlands, Norway and Sweden already achieve this. It is the just contribution of a rich country to the poor of the world. The economic theory that all boats – big and small – are raised by the incoming tide, or that as the rich get richer some trickles down to benefit the poor, are not true for the UK today. The use of Gross Domestic Product as a measure of national success is no longer appropriate. It doesn’t matter if GDP falls and, indeed, if as a result of levels of interpersonal trust increasing, the prison population declines and hospital admissions fall (among other factors) then GDP will fall! People are coming to realise that it is quality of life that matters, not economic growth. But there is more to the end of economic growth than out-dated economic theory. Almost inevitably, economic growth enlarges a nation’s carbon footprint. If we are to tackle global warming effectively the UK – and all other of the developed industrial countries – must consume less, travel less, and transport goods less – in other words, spend less and be less avaricious. Sadly, and perhaps catastrophically, our government wants Britain to spend its way out of the current recession in order to re-establish economic growth. In contrast, the Archbishop of Canterbury, Dr Rowan Williams, in his 2009 Easter message (endnote q) called on consumers to curb their appetites. The present financial crisis has dealt a heavy blow to the idea that human fulfilment can be thought about just in terms of material growth and possessions. The wage levels suggested in the scenario, while sufficient for a good quality of life, would inevitably lead to less consumption of goods, less travel, and less transportation of goods and thus reduce our carbon footprint. Britain needs to do this not only as our contribution to reducing global warming but as a starting point for persuading the rest of the developed world to follow suit. But in the process the millions of workers who produce the goods and provide the services we consume will experience contractions in employment. A monumental re-orientation of society will ensue. This is why citizen’s income is so important – to protect those who lose their paid employment. Of course, there need to be sufficient wage earners in order to provide the tax revenue for citizen’s income as well as to pay for health, crime prevention, education and all the other demands on the nation’s purse. Getting this balance right, as discussed earlier by determining the quantum, is the function of the Chancellor of the Exchequer and the Treasury, but, as this paper argues, they must start from the premise that economic growth is over and a gentle decline in gross domestic product is to be welcomed. Quite a mindshift! While the provision of citizen’s income will provide the means of sustenance for families where the breadwinners are out of paid work, the challenge for our society and its government will be to realign paid work nearer to the basic human needs of food and energy production and community life and service. In a companion paper, The Naïve Aspirations of a Convivialist, I have written about some of the ways in which a re-orientation of society, triggered by the ideas in this scenario, could enhance the quality of life for all. Here I will simply list the twelve suppositions put forward. Suppose that less energy is used, and more is produced locally. Suppose that nuclear energy is rejected because of the potential long term hazards, and suppose that more use is made of wind, wave and solar energy. Suppose that community spirit grows so that more people have a sense of involvement in their locality and of belonging to it. Suppose that communities become more self-organised and less organised by outside agencies. Suppose that communities become more caring of those of their members who are distressed, lonely, aged and sick. Suppose that people learn more about how to live in harmony with their own self. Would enhance the quality of life? Yes. Could happen? Yes – if the scenario of citizen’s income, minimum and maximum wage were implemented. Hopefully, with increase in interpersonal trust, people would gain quality of life more from community interactions and less from material possessions. Requires a major cultural change? Undoubtedly. Predominantly in the business world – but great opportunities. Families are more attuned to these notions. Would reduce our carbon footprint? Yes, substantially. The scenario, in the context of these aspirations, provides a powerful way of responding to the threat of global warming. Ecological concerns for the future provide the most important justification for the scenario. [VI]	GREAT IDEAS, BUT WHO WILL SUPPORT THEM? (6) that we owe it to our grandchildren and theirs to sort out the mess that we have made. In other words, we, the general public, and our political leaders have either a steep learning curve ahead or a precipitous social and ecological decline. There is one ray of hope for any brave politicians who recognise that this is the best way for Britain to move in the twenty-first century. Table 3 shows that 35 million adult people would be better off and 14 million worse off. In a democracy it should be possible to effect the changes put forward in this scenario! (i) Hours of searching government statistics on the internet have not located a breakdown of this figure and a telephone call to the National Statistics office elicited the response ‘I wouldn’t know where to begin to look’! (n) It is unlikely that these figures are directly comparable to those arising from the scenario of this paper. The UN figures are described as ‘for household incomes, after taxes and benefits, adjusted for the number of people in each household’. This site was first posted on 5 May 2009, amended on 6 September 2009 and 11 November with revised figures for the level of citizen's income, and the title changed from Narrow the Gap to Inequality Matters on 23 January 2010 in order to focus more clearly on what these pages are about. INEQUALITY matters! As noted above this essay was archived on 25 November 2015. It is replaced by a new essay entitled "A National Incomes Policy for the UK embracing Citizens' Income and so eliminating poverty and the complexity of most state benefits." Access it through Citizen's Income on the navigation bar (left).